As is widely known, on November 24th, 2016, the government of President Juan Manuel Santos, on behalf of the Colombian State, and the Revolutionary Armed Forces of Columbia-FARC (which has now become a legal political party) signed a peace agreement. This agreement brought to an end an armed conflict which had debilitated the people of Colombia for more than 50 years, and which had profound economic, political and social effects, creating painful divisions in Colombian society, its social fabric and within families. La Vía Campesina, an organisation bringing together 200 million women and men peasants from all over the world, which, at the request of the concerned parties, is one of the guarantors of the peace process, is very worried to see that, two years after being signed, key aspects of fundamental points in the Agreement for the Ending of the Conflict and the Building of a Stable and Lasting Peace have been modified by the executive, legislative, and judicial branches of the Colombian State. Thus, for example, Point 1, known as Comprehensive Rural Reform, calls for a rural registry to be created during the next ten years in order to clarify problems of land ownership. It provides for the creation of a Land Fund of 3 million hectares for landless or land-poor peasants, as well as for the massive clarification and formalization of property titles on 7 million hectares of landholdings. There has been practically no compliance with these provisions involving a total of 10 million hectares. With regard to Point 4: Solving the Illicit Drugs Problem is another vital point for the Colombian countryside and for rural communities. It calls for comprehensive plans, voluntary eradication, the participation of local and departmental authorities, and for government funding of substitution projects and programmes, all including dialogue with communities and community participation. These engagements have not been complied with; they have been replaced by criminalisation, prosecution, and punishment. Such departures from the Agreement had already started under the previous government of Juan Manuel Santos. They have been accentuated by the policies of the new president, Iván Duque, who has decided to give priority to forced eradication and aerial spraying with glyphosate, which has had serious effects on the health of human beings, animals and plants. These policies concretise a military and legally punitive approach to a problem that is above all social and economic. Essential features of fundamental parts of the Agreement, such as the Special Jurisdiction for Peace (JEP), were modified by the different branches of power. For instance, the obligation of third parties to testify at investigations has been eliminated. This not only prevents society from learning about the real participation of multinationals and that of national actors with ties to the banking and trading sectors and to cattle ranching and agribusiness – as well as the involvement of civil servants and civilian agents of the Colombian state in organising, funding, and supporting paramilitary groups and other structures and organisations that took part in the protracted armed conflict. As if this were not enough, the JEP has suffered another blow to its basic functioning. Its power to investigate and judge members of the military has been virtually removed, with the nomination of 14 new judges who are to assume that function. This change will undoubtedly provide a new cloak of impunity and immunity for military personnel. It will further weaken the right of victims to truth, justice, reparation, and non-repetition, as well as to find out what happened to their family members who were victims of torture, assassination, or forced disappearance, and to learn the name and identity of those who were responsible for planning and perpetrating these crimes. This change will make the work of the JEP, the Truth Commission, and the Special Unit for the Search for Missing Persons much more difficult. It is all the more serious when we consider that victims were the central focus of the Peace Agreement. The victims not only suffered a mockery of their rights with respect to this Point in the Agreement; the Colombian Congress also denied them their right, which had been stipulated in the Agreement, to 16 congressional seats. The political reform that was provided for in the signing of the Agreement is another point which the Colombian government and state apparatus have not complied with. 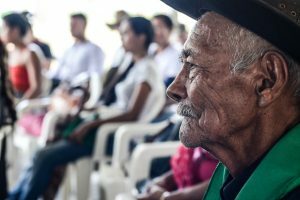 In relation to the Reintegration of FARC ex-combatants, the Peace Agreement stipulates that each ex-combatant should receive a sum of 12 million pesos for productive projects. There are also guarantees for the construction and repair of highways as well as for the provision of other basic services such as housing, health, training and educations – obligations with which the Colombian state has also failed to comply. What is most serious and most shocking is that, once the Agreement was signed, a series of murderous attacks was unleashed against the FARC ex-combatants and their families as well as against leaders and activists on the political Left, human rights defenders, environmentalists, peasants, students, indigenous people, and Afro-descendants, a relentless wave of criminal extermination that reminds us of the dark period when the Patriotic Union was obliterated. For its part, the Colombian State has failed to fulfil its commitment to combat and dismantle the paramilitary forces and to make them subject to the force of the law. According to spokespersons from the Colombian police, the Common Alternative Revolutionary Force (Fuerza Alternative Revolucionaria del Común) recently reported that more criminal attacks are being plotted against its leaders, activists, and members – one more stage in the campaign of extermination. The Democratic Centre and Colombian President Iván Duque have made repeated announcements regarding the Peace Agreement, on some occasions expressing a desire to tear it to pieces, and on other occasions declaring their wish to subject it to major changes and reforms. 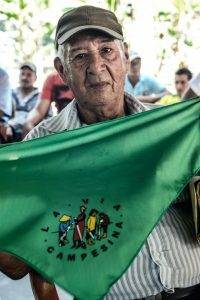 Our two International Solidarity Missions to Colombia, the first in 2016 and the second in 2017, gave us a first-hand understanding of the challenges to peace, of the vision of women and peasants in their territories, and of the necessity for environmental justice as a precondition for social justice. We are committed to the peace process and to our role as guarantor. We will be organising our Third International Solidarity Commission in 2019, in the fervent hope of finding a people and a government advancing towards a stable and lasting peace. For all of these reasons, La Via Campesina is appealing to the Colombian People, to all of our member organisations in different parts of the world, as well as to the international community, the United Nations, the FAO, the ILO, the European Union, the Non-aligned Countries, governments, organisations, and personalities. We are asking them to speak out and to demand complete fulfilment, without reforms or delays, of the Final Agreement for the Ending of the Conflict and the Building of a Stable and Lasting Peace.